Had an amazing stay as always - thank you and will be looking forward to visiting again! Consistently high standard, we will continue to come back. We enjoyed our stay at the Alto. Our bed was very comfortable and our 3rd guest commented on the comfort of the sofa bed.We did enjoy the view over Bourke Street. We had a restless night on the Thursday night due to the band playing across the road at the Royal Melbourne. The noise was very loud and we connacted reception for more info about the event. Saturday was also disturbed but we could sleep through the partying. We also had an issue on checkout. This was resolved very quickly with a signature check as someone had charged their dinner to our room! Awesome location. This small hotel has everything. Sorry the weather was so bad but we did have the fabulous passes for South Pacific Health Club. It was a great place to spend the night. Very convenient and comfortable. A warm & friendly place to stay, convenient to transport & places of interest. Good food & service. Will come again. Great location. Lovely staff and service. Loved the massage room. Thanks. Great stay, will definitely book Alto on Bourke again. Nothing was too much trouble from the staff who were professional, courteous and friendly. Our family has stayed at Alto at least 4 times over the past few years and have not considered looking anywhere else. So convenient, a warm welcome and rooms and services which suit our needs very well. Even the other guests are friendlier than at other places where we have stayed before. Keep up the good work. Thank you. We hope to visit again soon. Really enjoyable - the 3 bedroom was perfect for our family. We were checked in promptly with no fuss and all our questions answered. The location was great and a good base to get to just about anywhere in Melbourne & surrounds. Would recommend to family & friends. Friendly and efficient staff. I love that they give passes to a local gym. Loved it! This was our fifth time at the Alto. Great location, staff and meals. The hotel was great. 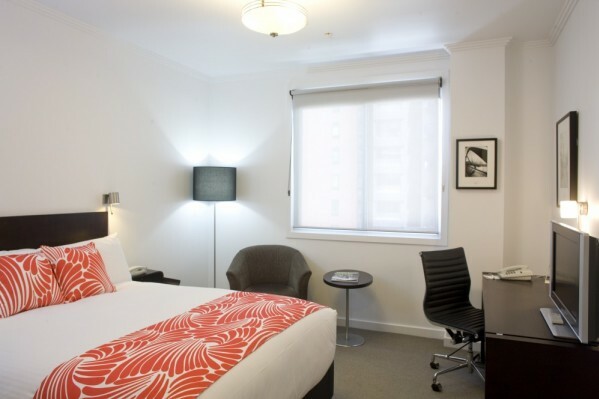 Very clean, great service, friendly BUT the room was very hot - even with air con turned down, I had to sleep without bedclothes and the window open - in Melbourne in winter!!! However, loved the library, relaxation room, fresh fruit. The little touches were great. All beds have 2 sets of pillows for our guest to choose their preference. 1 is latex insert that is firm and holds it shape. The other set are microfiber that are soft and can be folder (ie similar if use to a feather pillow). Both sets are hypo allergenic. More pillows are available on request. Breakfast was very yummy. Bed was very comfortable and room clean. Loved the picture hangings in the hallways. Staff were pleasant. Shower kept going hot and cold and door was very small. That's my only complaint. Location ok, good for skybus but there are more cbd central hotels definitely. My husband and. Thoroughly enjoyed our stay at Alto. I was very impressed and will stay here again when in Melbourne. I stay here whenever I am in Melbourne. I am very comfortable here, and it's very convenient to everything I need. I liked the place. The green credentials drew me in, but the overall quality of the place makes me want to come back. Quiet, clean comfortable, reasonably priced and easier on the environment than other hotels. An environmentally friendly hotel that is home away from home. The staff are friendly and well informed. Our room was very clean and spacious. Best hotel bed I've ever slept in, super comfortable and the pillows were fluffy. Shower was luxurious with good shower head and water pressure and wall mounted dispensers provided plenty of shampoo, conditioner, soap and lotion with no wastage. The powerful hair dryer was extra nice too! Other thoughtful extras such as free massage room, free wi-fi, library by the fireplace, fresh fruit and coffee/tea facilities at the lobby make this hotel very special. Will definitely stay here again and will highly recommend to family and friends. I was a first timer at the Alto and I enjoyed it very much. Fantastic location, near Skybus and work. Appreciated the efforts to recycle and minimise energy usage - and the free wi-fi. Place had cosy, more intimate feel compared to some other bigger hotels. Hope to be back. All fine. Only gripe is that the company that provides your room service does not make food fit for human consumption, it's absolute low quality dirt and this reflects really badly on your brand. The service used on this occasion is a delivery option from a central kitchen who deliver to several apartment complexes. We have included their menu in our rooms as an additional option to our in-house room service operated from our kitchen. We are reviewing the service provider overall quality.